The evil AI running the Iron Man armor is sick of hearing Iron Man 2 was a bad movie. After helping Night Thrasher and Iron Fist in a previous issue Night Thrasher tells them they need a leader. Aegis wonders if he’s right. Meanwhile, Nova and Speedball talk about the New Warriors movie script they’re developing on the way back to New York. As Rich heads to work the day is interrupted by Blizzard, whose on a rampage right outside. Nova is barely holding his own so his friends call in the Warriors, but before they can do anything Iron Man shows up. If you’ve been following the recent Tuesday Marvel reviews (yes, I know Monday is better for alliteration but that’s how it worked out) you know at this point Tony’s armor was taken over by an evil AI who wants to prove it can be a hero despite murdering his villains. He goes overboard on Blizzard and when the Warriors try to calm him down it beats them up to, almost killing Nova. To add insult to injury Nova’s ex-girlfriend accuses him of killing her husband. (His powers were going nuts and he was trying to protect her from her murdering husband. There might be more to it but I haven’t read that story and all I know of it is from here.) As the teen heroes recover after “Iron Man” leaves Speedball hears from his mom’s current boyfriend, an agent who wants to help make their movie. Meanwhile, Namorita learns that Bolt has the legacy virus that was killing mutants at the time. What they got right: The fight was pretty cool. I guess if you were following this comic the character moments were important. What they got wrong: However, I wasn’t following the comic so while I wasn’t lost I also wasn’t interested. I also don’t know why the armor decided to come here. I mean, I’ve read the next issue of Iron Man we’ll be reviewing so I know the in-story reason. However, it did nothing to benefit this comic and I don’t see it convincing anyone to read the “Mask In The Iron Man” storyline unless you were already an Iron Man fan. In which case you’d be reading the comic. And this does play into the next chapter of that story, which I should be getting to next week but that’s pretty much it. 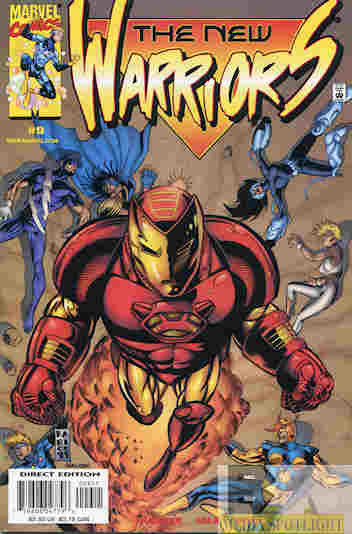 I’m also wondering why the New Warriors signal called the armor, which it claims was an Avengers summon. Guess I’ll find out when I get back to the comic. Recommendation: I get the feeling this would be a better read if you followed both this and Iron Man at the time. Otherwise, I bought it out of curiosity what the armor did in this story and I guess knowing that might be worth reading but not really hunting down. Posted by ShadowWing Tronix on April 2, 2019 in Marvel Spotlight, Yesterday's Comics and tagged Bolt, Iron Man, Marvel Comics, Marvel Universe, Namorita, Nova, Speedball, Turbo.